Which command line based text editor would you recommend to a beginner and why? 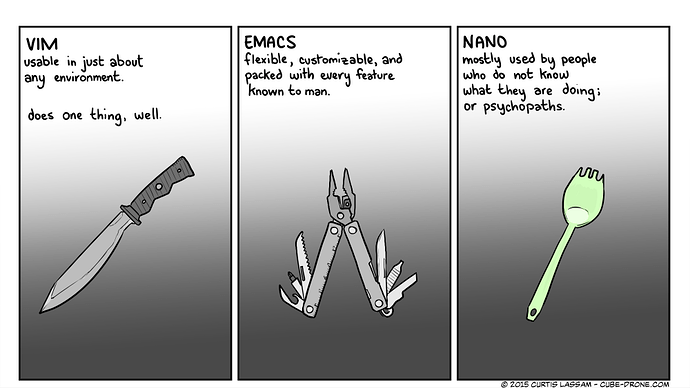 Is it vim or should a beginner be suggested a more familiar one like nano? Knowing Vim basics will help a great deal. Nano is good but there will be times when you won’t find it installed on a Linux machine but Vim/Vi will always be there. I love Vim: I tried many different text editors, but always come back to that one. And indeed, some vi flavor is always available so a basic knowledge of that editor is a must have skill. However, it can also be a great way to disgust newcomers of working at the console. Especially for people having only known previously GUI tools and intuitive touch interfaces. Once students are more comfortable with the concept of launching a tool from the console, it is easier to switch to console-only work. I recommend nano to beginners. In my opinion, I would recommend VIM. Although the learning curve is steep, it is worth the effort to master. Generally speaking, convenience comes at the price of efficiency, and I feel that is the case in this regard. Beware that when you use vim regularly, you will accidentally behave every text editor like vim and you will be disappointed when your vim command will not work on them!! At least it is like that for me. I always tried to use my browser like vim especially search command “/”, therefore, I find an extension and I am using my browser like vim now. I use Visual Studio (software development editor for Windows) with vim extension too. When I have to use another IDE or text editor, I first check if it supports vim extension. For beginners gVim should be easy. Disclaimer: This is not to offend anyone, or to discriminate any editors. This was created purely for fun. Never used it but I am guessing that it’s Vim in GUI which is not what we could call a command line based text browser. They’re not meant for beginners. But I agree for nano. Well, it has the same commands as Vim from the command line - for a beginner, the gVim will help him master Vim. So his learning curve reduces. I’ve settled on using Pico (in old days) and now Nano. Nothing could be easier to use, IMO. nano or joe, because had no command-mode and they had help “window” which can be active by default. I suggest vi/vim. It may be awkward to start with but once your fingers learn 3 or 4 basic commands then it will reward you with a lifetime of flexible editing. It can be expanded to do many things, even fuinction as an IDE (sort of - see [http://www.alexeyshmalko.com/2014/using-vim-as-c-cpp-ide/]). Nano will, like Windows Notepad, get the job done quickly and easily but you won’t learn much from it. Perhaps they remember it as WordStar (https://www.wikiwand.com/en/WordStar), perhaps they already known it with different names; as far as I remember was the default keybinds for Borland’s products, that means today Delphi too. Vim for two reasons. First - beginners goal is to become at least intermediate user and vim will help him a lot to go on a right track. Second - vim (unix famous vi) is absolute classic.